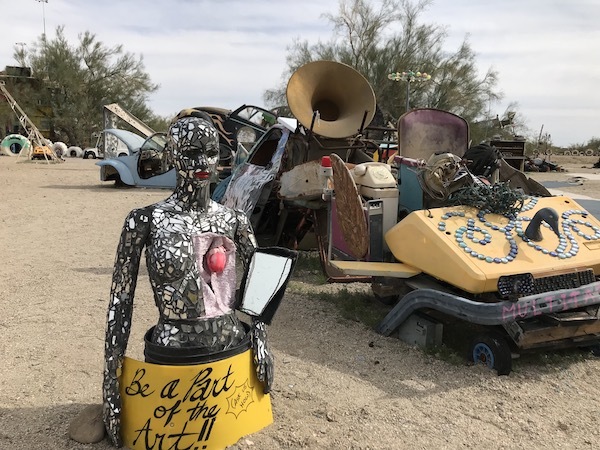 After a morning spent seeing the blooms and beasts in the Anza-Borrego desert, it was off to our next stop, Slab City. Despite an utterly conformist appearance to the outside world, I’ve always had a romantic yearning to be untethered to middle-class entrapments. 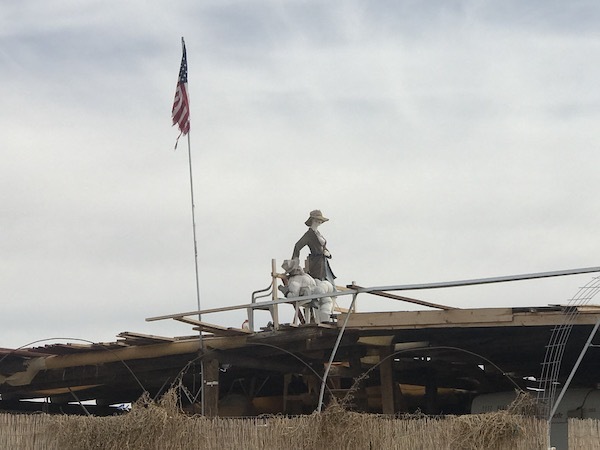 That is one of the reasons I wanted to visit the unincorporated desert community near the southeastern shore of the Salton Sea. Sitting on a former military installation, it exists without an organized municipal government (mayor, town board, police department), collects no local taxes, and provides no public services, (school. water, electricity, trash collection). Its residents (the population varies from several thousand during winter months to less than 200 in the summer when temperatures routinely rise above 100 degrees), call it the last free place in America. Early on, many of them were homeless, migrants, squatters and survivalists looking to live off the grid. Over time they were joined by snowbirds, retirees and artists. 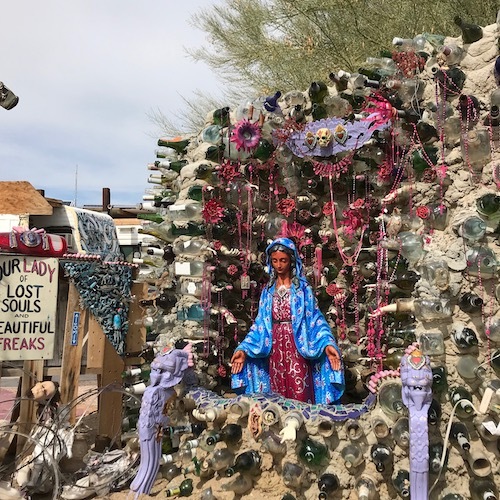 Today, Salvation Mountain, a three-story tall technicolor folk art homage to God, and East Jesus, “an experimental, sustainable habitable art installation”, which sit on opposite sides of Slab City, draw thousands more visitors to the community each year. While Salvation Mountain could be seen miles in the distance, this marker let us know we were actually on the outskirts of Slab City. interspersed with a semi-permanent looking building or two. the mannequin standing sentinel on its roof gave me a little “the Hills Have Eyes” shudder. As we entered the East Jesus area, the dwellings began to take on a decidedly more creative air. We parked and entered what initially looked like a cross between a carnival mad max movie set. The roots of East Jesus go back to 2007, (the name is not rooted in religious connotations, but based on an old term for someplace in the middle of nowhere). 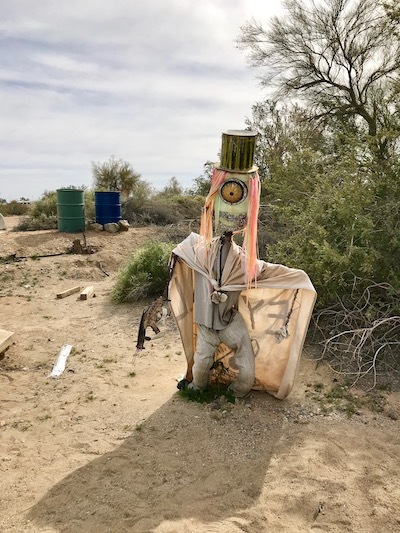 After coming to the area earlier and working on Salvation Mountain, in 2007 Charlie Russell decided to leave his former life behind and moved out to Slab City. He began creating sculptures out of recycled discarded materials around his two art cars, which formed the foundation of of East Jesus. 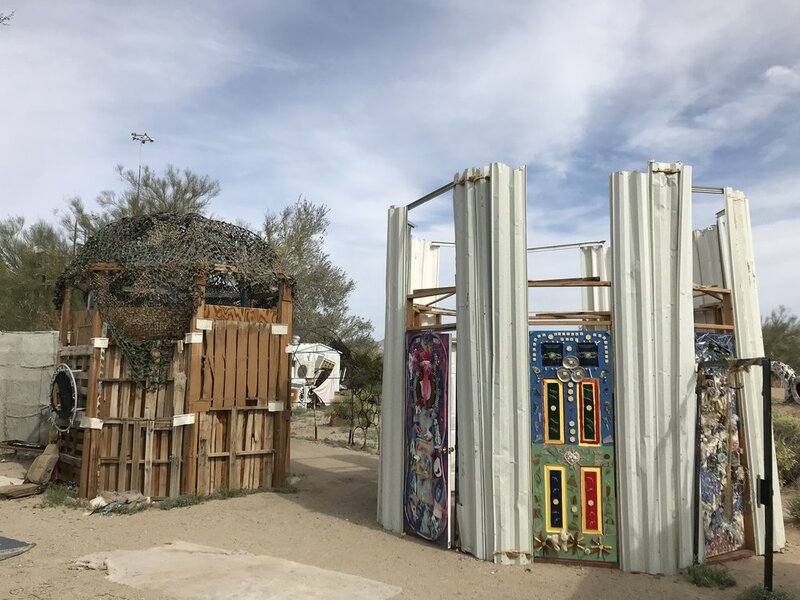 More artists began to participate, and the project morphed into its own sub-area of Slab City. After his death in 2011, a nonprofit called The Chasterus Foundation was formed to carry on his legacy. but we quickly found the artists and residents incredibly welcoming and engaging. Visitors are encouraged to wander about any of the public areas and interact with any of the art, so long as they are respectful of any private area signs. All of the art in the town is made from recycled and reclaimed materials, and takes a variety of forms. To truly appreciate the pieces, it was necessary to explore them from all sides and angles. The structure on left below, which appeared to be made of raw wooden shipping pallets from the outside. contained beautiful decorative panels within. The art cars likewise held interest from every angle. Ot this top-hatted Cyclopian fellow. East Jesus is a real multi-layered experience that you can easily spend an entire day at (even longer). Although we barely scratched the surface, we still had Salvation Mountain and the Salton Sea to visit before dinner, so we (a little reluctantly) got back in the car to drove back through Slab City to see the Mountain. To learn more about East Jesus, the Chasterus Foundation maintains a very informative website (click here).